I’m often asked what is the difference between free field microphones, diffuse field microphones and pressure microphones. For a run-of-the-mill ½ inch microphone the short answer is nothing. However the long answer is a bit more involved. Basically if the frequency range is below 16 kHz and an accuracy of ±2dB is acceptable then there is no real difference between the types. So what is the difference between these types of microphone? Well, first you have to understand the different types of sound field involved. In theory a free field is a sound field where the sound waves are free to expand outwards forever from the source. That is, we assume that there are no reflections or reverbarations. In practice, we would consider an anechoic chamber to be a free field or an outdoor measurement, provided we measured at a sufficient distance from the ground. A diffuse field or a random incidence field, is a sound field where the sound waves arrive equally from all directions. Another way to think of a diffuse field is that you have sounds coming from different directions in succession with no time inbetween their arrival. For example, in a diffuse field the sound waves that arrive at a person’s ears are so completely different that the brain finds it impossible to work out where the sound came from. A pressure field is a sound field where the sound pressure has the same magnitude and phase at any position in the sound field. It is important to understand that all of these microphone types are fundamentally the same. They are transducers that are designed to sense pressure levels in air. The differences between them are in the designs of the microphone heads. Each type of microphone will normally be supplied with a calibration data sheet that will show the frequency response against sound pressure. Comparing the frequency response against sound pressure for the three microphone types will show the differences clearly. The differences between the three types of microphone generally occur at higher frequencies as we stated previously, below about 16 kHz the response from each will be similar. This is partly to do with the physical size of the microphone with respect to the wavelength of the sound being measured. Free field microphones are designed to compensate for the effect of the microphone itself in the field. So you measure the sound as though the microphone was not there. They are designed this way as, of course, the presence of the microphone will affect the propagation of the sound wave. A free field microphone should be pointed towards the sound source at a 0° angle of incidence. Diffuse field microphones are designed to respond in a uniform manner to any signal arriving on its measuring surface from any angle. Generally, these tend to be oriented at about 75° to the direction of the sound wave propagation in a free field. Pressure microphones are designed to respond to a uniform frequency response to the sound level itself. When used in a free field a pressure microphone should be mounted at 90° to the direction of the sound wave propagation, effectively the sound passes the measuring face of the microphone. For a run of the mill ½ inch microphone the short answer is nothing. Basically if the sample rate is 10 kHz or below, and in terms of accuracy within 2dB is ok then there is no real difference between the types. Well firstly you have to understand the different types of sound field involved. A free field is a sound field where the sound waves are propagating freely through a medium, for example a large room or sound chamber with no objects to interfere with the movement of the sound waves. A diffuse filed or a random incidence field, is a sound field where the sound waves arrive equally from all directions. For example in a diffuse field the sound waves that arrive at a person’s ears are so completely different that the brain finds it impossible to work out where the sound came from. An important point to understand is that all of these microphone types are fundamentally the same, they are transducers that are designed to sense pressure levels in air. The differences are physical in the design of the microphone head. The three different types of microphone will all normally be supplied with calibration data, this calibration data will show the frequency response against sound pressure. Comparing the frequency response against sound pressure for these three microphone types will show the differences clearly. The differences between the three types of microphone generally occur at higher frequencies as we stated previously, below about 10 kHz the response from each will be similar. This is partly to do with the physical size of the microphone with respect to the wavelength of the sound being measured. Free field microphones are designed to compensate for the effect of the microphone itself in the field. So you would be measuring the sound as though the microphone was not there. They are designed this way as of course the presence of the microphone will affect the propagation of the sound wave. Diffuse field microphones are designed to respond in a uniform manner to any signal arriving on its measuring surface from any angle. Generally these tend to be oriented at about 75 degrees to the direction of the sound wave propagation in a free field. Pressure microphones are designed to respond to a uniform frequency response to the sound level itself. When used in a free field a pressure microphone should be mounted at 90 degrees to the direction of the sound wave propagation, effectively the sound passes the measuring face of the microphone. According to your graph the frequency responses start to differ at 1.6 kHz. not at 16 kHz as stated in the text. For a 1/2″ mic the free field response is rather bad – at least for a B&K mic. A good 1/2″ mic can be flat within +/- 1 dB up to 16 or even 20 kHz. I’d like to respond to your comments if I may please. The 16kHz mentioned in the article was intended to show a band, for example with a +/-3dB tolerance the microphones are similar in the frequency range of 5Hz to 15kHz or 16kHz. If the tolerance band you can accept is wider then the frequency range at which any type of microphone can be used it wider still. Conversely if the accuracy you require is narrower then the frequency range will be further restricted, well below the 1.6kHz you mention. So it depends on the required tolerances of your test. I am quite sure that several microphone manufactures make many different types of microphones with different advantages and disadvantages and importantly different amplitude ranges and different frequency ranges. The objective of this article is to demonstration the difference between the types of microphone, not to critique any particular type. Thank you for your explanation but i continue having some doubts. 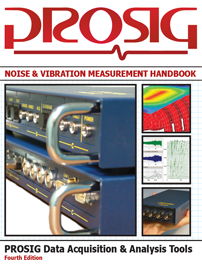 Imagine that you want to measure noise to a motor or generator in a test bench. The motor/generator is rigidly fixed to a steel floor and around the motor/generator you have some walls–>the distance between the walls and machine varies in each face of the machine. What kind of microphone would be the best to measure the noise of the machine? Thank you for posting a question on our blog. This article shows the frequency ranges where different microphones types under test either behave or do not behave in the same way. Therefore, once you have answered this question you can view the datasheet of a given microphone and check that it behaves the way you expect it to across your frequency ranges of interest. I would suggest that you start with a free field microphone as this type is often the most accurate when measuring sound pressure levels that radiate from a single source. The free field microphone is best for situations where there is a single sound source. The pressure microphone is best for situations where there is a continuous sound wave and uniform sound wave, the microphone will take account of its own presence in the sound field. The random field microphone can be used in situations where sound is coming from any direction or all directions towards the microphone. My frequency range of interest is between 500Hz a 2500Hz. Thank you for again posting on our blog. In short I would use the free filed microphone. At those frequencies it is unlikely to make a huge difference. I have some doubts about the microphone position and wave length. For example, I use microphone which have frequency range 20 Hz – 5 kHz measure sound from single sound source that generate sound frequency 100 Hz. Do I need to position the microphone away from the source sound more than 3.43 m ? (sound speed in the air 343 m/s and wave length at 100 Hz is 3.43 m) if not why ? Thank you for asking a question on our blog. I understand the objective of your question. You do not need to leave a full wavelength between a source and a measurement microphone. Wherever you place the measurement microphone it will measure the complete wave form as the wave passes the microphone. I have an application wherein I am trying to run and test a motor and gearbox assembly for Vibration and Noise. Now, this assembly is going to be tested on a traditional shop. So there are going to be other equipment and activities going on as well that are going to generate their own noise, which I don’t want to interfere with my measurement greatly. I don’t intend to have an anechoic chamber to carry out these analysis. So, in your opinion which mic is better suited for my application, a free field or pressure? Is there any difference in the directional response of these microphones. I studied datasheets of multiple manufacturers, but strangely, none of them have any directional characteristics specified. Also, in your opinion, do you think 1 mic will be sufficient to give me a good enough response or will I require more? I have decided that I will require a frequency range of not more than 10 Hz to 20 kHz. That sounds like a fairly complex problem. We would recommend speaking to an expert in noise measurement. They would be able to take some test measurements and advise on the best method of performing your test. Prosig offer this type of service or you could find someone local to you. If you think we can be of assistance please contact us at sales@prosig.com. * I meant traditional shop floor. To my opinion, the explanation is not correct. The pictures shows a FF mic in a FF, a random mic in a diffus field etc – and not a comparison of the 3 mic types in the same sound field type. So the picture shows what level of perfection and upper limit can get achieved for each type. – Pressure mic get used mainly in small closed chambers, e.g. in test adapters for testing hearing aids. It sounds to us like you know your microphones! We have written the article in such a way to try to be clear, but your quite correct to raise the issue of the microphone measuring face angle to the wave direction and the different microphone types in the different fields. I like your final list of which type to use when, practically speaking, and we welcome your useful and helpful comments, thank you very much. Please fee free to continue to share your knowledge. 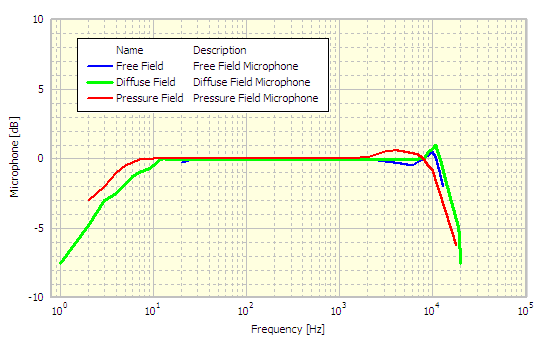 We are trying to collect data – pressure and phase(frequency range is 10-50 Hz) from two microphones placed inside closed tube( d= 10cm, L = 3 m) with a generating subwoofer connected to the other end of tube. What types of microphones do you suggest? The difference between FF, RI and pressure microphones only covers the high end of the frequency range. 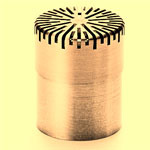 – the mic capsule has a pressure adaption hole to make sure, that weather changes do not distroy the membrane. Typically resulting in 1 to 10 Hz for the -3 dB point. Both have a similar role as the ecustachian tube of the human ear. Look for a preamp suitable for low frequencies. It must also can work acoustically at very low frequencies, if the body is acoustically exposed to the sound wave. Elsewise only the electrical frequency response is important. But with such configuration we are coming into the area of surface microphones; an speciality I dont know. In tubes you can get also very high pressure levels (by standing waves). So the mic diameter could play a role – something to check for. You colud also check tube-based absorption measurement products on the market for what kind of mics they use. There the mic and preamp is mostly outside the tube, only having the opening inside the tube (sitting 90 angle degrees to the tube). Then it plays a role, if the mics (capsule) eucstachian tube has its opening in direction of the protection grid, or looking to the back of its housing – then using the preamps hole. Thank you for your helpful and insightful input, we really appreciate you sharing your knowledge. I have an application where I have to localize a moving vehicle on the road with the help of an array of microphones. I will place microphone array at some distance from the road. I would like to know which type of microphone will be effective Free field, Random incident or any thing else? Is there any difference between Random incident microphone and Omni directional microphones? all measurement microphones are of the type OMNI; Freefield microphones are optimized for a flat wave coming from the front, delivering a frequency response as if they would not disturb the sound waves – although they do. Random mics are optimized for chambers like a reverberation chamber and for room acoustics in general. They should listen in all directions, but they looks to a same degree as freefield mics in all directions. The only special thing is – since both types are omni’s – is that for high frequencies the RI mics are more sensitive (lift of the high frequency response in FF), allowing the sound from the side and back, where all mic have a drop in their frequency response, to gets more weight, (Pressure mics are for coupler applications – leave them out here). So in other words, it is more or less only a frequency response difference between FF and RI mics; and therefore can get emulated in software, if the equipment allows mic frequency response error correction. Then you can miss-use that feature for FF/ RI “convertion”. With class 1 professional mics, the supplier delivers mostly a chart showing the difference between FF, RI (and the calibration curve also – don’t want to go into this). With some campinies you may need to ask. I am no specialist in acoustical camera, but it seems to my logical, that a device like a AC, which looks froward and needs for good resolution the capability to look strictly forwards and not side-wise is of top relevance, that FF capsules do better than RI types. I looked up with two leading mic suppliers their array microphones and they are principally of FF type; but they seem to have a slightly optimized curve; a slight dip in upper frequencies and a slight push above 10 kHz. Mostly array mics are of 1/4 inch size, having anyway a broad listening angel. Since making a acoustic array/ camera is buying heaps of mics, it makes sense to get in contact with specialists to make really sure, that you get the best out of your investments. Thank you both for posting on our blog. Sunil, I think your question has been well answered by Gurtner. If you do need to build your own array, I think I would suggest type of microphone you use will not be one of the significant issues to address, I think I could guess at many more issues to consider first. Gurtner, thank you for your helpful comments! The relativly new (2014) standard ISO EN 16283-1 seems to leave that open; I think it should not play any role as long as the mics in both rooms have the same characteristics. The new standard is rather complex, since several measurement mode use a moving mic. To be sure to be standard compliant, I guess you will need to buy the standard and spend some time in details. I myself have so far only made measurements according to earlier standards – have no practical experience. Be aware, that the reverberation time in the receiving room has an influence and must get compensated, based on a RT measurement. For precise measurements in both rooms several positions must get measured and the integration time is defined. The ISO EN 16283-1 standard is rather new and replaces several 140-x standards; being more precise in the requirements, being about 50 pages long. Please check also, if the standard discussed here is the relevant one for your country. Thank you for posting on our blog, I agree with your points fully. Usually for any sort of absorption testing, the microphone type would be a free field microphone. You should consider the standard your working towards, almost all standards will specify the type if the type is important to the result. If the type has no effect on the result for example, then its usually left open. This blog is super helpful! I am a PhD student studying hearing aids and we use various methods of stimulus delivery in different types of fields, so this was very helpful! Thank you for you positive comments, it is very nice to read. Can anyone please advise if and how it would be possible to measure the frequency response of miniature headphones, so called in-ear monitors? I don’t know of any way to can measure the frequency response of headphones plugged into the ear cannal, other than with an artificial ear (extremly costly). For headphones sitting on the ears, a “poor mans” solution would to put a 1/4 mic between headphone and the ear, at the bottom of the ear, where is sits well and mostly fairly air proof. But also then, a head-related frequency response correction curve is required. Mr. Olive from Harman did some research on this, just surf the web about his large headphone investigation he made maybe 1.5 years ago. The reason is: The ear has a impedance influancing the frequency response. – and it is a complex one, emulated by several “chambers” in the adapter. Be careful when trying to couple mic and other parts in a air proof manner, you can ruin the mic diaphragma by the air pressure or vacuum while fixing them together. Thanks Alastair, really good points and useful information. You are looking at a very small part and that in itself creates some issues. I understand the process you have outlined and the graph you have provided is interesting, there does appear to be some variation in results. I would imagine this variation is due to the differences of design/manufacture in your microphones. It is also possible they are not the correct type for this sort of testing. There are some companies that produce equipment, specifically for testing over head and in ear headphones, GRAS is a name that comes to mind for example. Following on from the great comments from Alastair, it is very easy to damage a microphone in this fashion, I would not recommend anything that was ‘air tight’ at all. Have you considered using an accelerometer to find the transfer function rather than a microphone, I think it would not be perfect, but I have heard of people doing this for low frequency projects in the past. Other than that I think the next solution would be the more costly artificial ear solution. Please post back how you progress!